Drawing retrieval is simplified because all related drawings are kept together. These sturdy drawing portfolios make transporting your drawings easy. Comes 10 per carton. 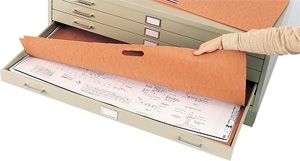 For Drawing Size 24" x 36"
Actual Folder Dimensions: 36-1/2" x 25-1/2"
For use with Safco Steel Flat File Cabinet 4994.